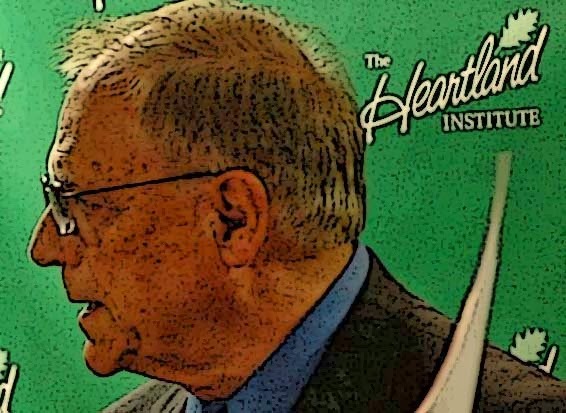 Denier Don Easterbrook is America's answer to the potty peer from the UK, Christopher Monckton. He's written an article on WUWT (archived here) in which it's hard to find half a sentence of his that might have a grain of truth to it. The exceptions would be his direct quotes from an article in National Geographic. A few weeks ago Anthony Watts told his readers not to be alarmed because ice can't melt when it gets hotter, therefore seas can't rise any faster and New York can't get any wetter. He didn't phrase it quite like that but that's what his article all boiled down to. He was referring to this same National Geographic article. Today Anthony Watts has gone even further and put up an article by denier Don Easterbrook (more of his deceptions here) that rivals his various claims like "the average surface temperature of earth equals minus 30 degrees Celsius as shown by my temperature chart for Central Greenland". Denier Don is (still) an Emeritus Professor from a University that he's continually embarrassing. They don't withdraw titles too easily and I guess that he's not the first professor to have "gone emeritus" and won't be the last. If you consider the steady state of earth's atmosphere (not rising CO2), the net effect on radiative forcing by absorption of long wave radiation is: carbon dioxide 19%, water vapour 50%, clouds 25%, all other forcings 7%. For clear sky forcings (no clouds) the long wave absorption (greenhouse effect) is: water vapour 67%, CO2 24% and other forcings 9%. Denier Don is wrong. Even including clouds, 19% of the greenhouse effect is attributed to carbon dioxide. That's normal conditions. It doesn't describe the impact of rising CO2, which causes water vapour to rise and ice to melt, which add further to global warming. Even without factoring in feedbacks, a doubling of CO2 from pre-industrial levels will heat earth by one degree Celsius. Carbon dioxide can be viewed as the "control knob". As CO2 changes it affects the amount of long wave radiation leaving earth. As CO2 increases, less long wave radiation escapes to space and earth warms up. This causes feedbacks. As earth heats up more water evaporates resulting in more water vapour, itself an even stronger greenhouse gas. There is less ice and snow so less short wave radiation is reflected and more is absorbed. The net (medium term) effect for a doubling of CO2 is most likely between 2 and 4.5 degrees Celsius. The long term effect (earth system sensitivity) would be greater. Denier Don writes: By itself, it (CO2) is incapable of warming the climate by more than a fraction of a degree. Denier Don is wrong. A doubling of CO2 amounts to a forcing of 3.7 W/m2 or about 1.1 degree Celsius. Taking account of feedbacks means that the full impact in the near term would most likely be between two and 4.5 degrees Celsius. All the physical evidence shows that CO2 causes significant atmospheric warming. Tyndall first measured this back in the mid 1800s. Denier Don is wrong. Physical evidence demonstrates CO2 causes the earth to shift from ice ages to interglacials for example, because it rose as a feedback after changes to earth's tilt etc caused a small rise in the amount of solar energy absorbed on earth. Denier Don is wrong. The IPCC reports describe observations of past climates with direct physical evidence of the role of CO2 in controlling the climate. Denier Don is wrong, even on its own without allowing for feedbacks, CO2 accounts for 24% (clear sky) or 19% (including clouds) of the greenhouse effect. That's not what CO2 contributes to global warming - it's what it contributes generally, compared to water vapour etc. Denier Don writes: ...they introduce an increase in water vapor (which is responsible for 95% of greenhouse warming), claiming that as CO2 goes up so does water vapor. Denier Don is wrong. Water vapour accounts for 67% (clear sky) or 50% (including clouds) of the greenhouse effect. Don is implying that more water can't evaporate as it gets hotter? That's ridiculous. Of course as it gets hotter more water evaporates and this has been measured in observations. Denier Don writes: The National Geographic claims that CO2 has caused 1º F of warming this century. But CO2 didn’t begin to rise sharply until after 1945 so cannot have been a factor before then. Denier Don is wrong. What Don writes about it "cannot have been a factor" is a logical fallacy. Earth has been warming since CO2 started rising. Early last century it was not the sole contributor to global warming. There was also a contribution from an increase in solar radiation. Since about the mid-1950s, most of the increase in global surfact temperature is because of the increase in greenhouse gases, particularly CO2. Denier Don writes: Temperature data shows that 0.7° C of wrming occurred from 1900 to 1945, before CO2 could have been the cause and while CO2 emissions soared from 1945 to 1977, global temperatures declined (just the opposite of what should have occurred if CO2 causes warming), and only 0.5°C warming from 1978 to present coincided with rising CO2 (and that is very likely coincidental). Denier Don is wrong: If you look at the chart below you'll see that the temperature fell from the 1880s and rose between 1900 and the mid-1940s then flattened a bit before rising very sharply. If you add Don's 0.7 and 0.5 degrees you get 1.2 degrees, which is 50% more than the actual warming of 0.8 degrees. What he is doing is picking start points and end points rather than longer term trends. Even so, what he writes is illogical. CO2 has been rising since the industrial revolution, so of course it has contributed to global warming since that time. Early last century other factors also contributed, particularly the increase in solar radiation. Since the middle of last century CO2 is likely responsible for pretty well all of the warming - around 0.6 degrees. Frankly, I can find almost nothing that Don claims to be true. It's just one big lie from beginning to end. 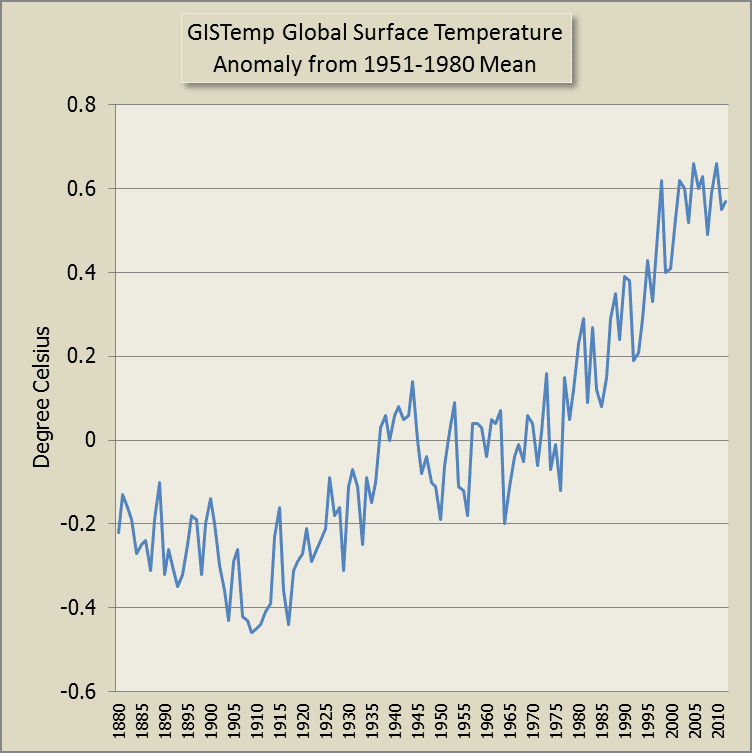 Denier Don even tries to claim that the world has cooled in the past 15 years, which is false, as the above chart shows. That this (ice sheets in Greenland and Antarctica will melt) is not going to happen is shown by (1) there is no evidence that this has ever happened in the past and several factors insure that it won’t happen any time soon, (2) Antarctic glaciers are frozen to their base and move by internal flowage of ice, not by basal sliding, (3) these ice sheets lie in basins, and (4) the Greenland ice sheet is behaving just as it has in the geologic past and there is nothing unusual happening to it now. Here's a NASA video about Pine Island Glacier in Antarctica and the ice shelf that's holding it back. Carbon dioxide is a trace gas that makes up only 0.039% of the atmosphere, accounts for only 3.6% of the greenhouse effect, and has increased by only 0.009% since 1950. Before the industrial revolution, CO2 was around 285 parts per million. Now it is around 400 ppm. Denier Don can't do his sums. 400-285 equals 115 ppm. 115 divided by 285 equals 0.41 or 41%. That's how much CO2 has increased. It's increased a lot more than 0.009%!! If he was trying to say it went up by 90 ppm since 1950, that would be a 28% rise since 1950 not a 0.009% rise! It gets even worse. 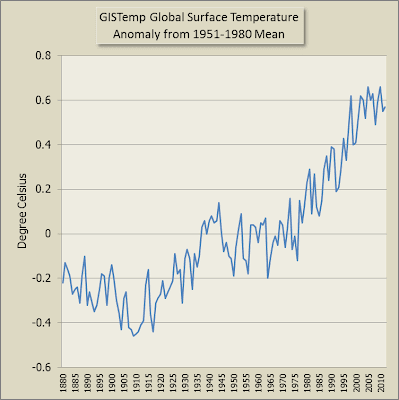 Don puts up a chart of what he claims to be temperatures of the past ten years to try to claim the world is cooling. He labels the chart as "modified from Monckton, 2013". He quotes the potty peer as an authority - ROTFL! I challenge anyone to find, say, three claims out of the dozens that Denier Don makes in his pack of lies that are supported by the evidence. Here's the archived WUWT article. Have at it, folks! First of all, thanks for the article. Here are some things I have been wondering as an amateur scientist. Figure 4 shows the hadcrut temperature data. First, isn’t the hadcrut data just the north american ground based weather station data? I don’t understand how this is a proxy for global temperature. Second, Hasn’t Anthony Watt’s paper demonstrated that hadcrut is seriously flawed? Why do I keep seeing that temperature set in articles written by skeptics, when the real temperature would show that the temperatures at the end of this century were lower than in the 1940′s? Denier Don's chart isn't fake but he has missed the last year of data because it is incoveniently high. It is the satellite data without the correction for the seasonal component of the signal. The CMAR people have also estimated that the larger part of the dip in sea level seen during 2010-2012 was due to the flooding in Queensland alone! Thanks, SCM. You have sharp eyes. I've updated the animated chart and the text accordingly. Of course he commits the usual deception of showing the concentration as a small number, implying that its effects will we small too. Wrong. Don is saying by 90ppm since 1950. Who knows why he chose 1950? It would be more accurate to say 95ppm since that date anyway, but as also illustrated by his truncation of the SL data, he seems to have an aversion to using up to date figures. Don is wrong. What Don did was a subtraction (subtracting 0.03% from 0.039%) and said it was the same as a percentage change in the amount of CO2. It's not. Atmospheric CO2 has increased by more than 40% since industrialisation. If he's going from 1950 then CO2 was 315 ppm in 1959 and I don't think it went up 15 ppm between 1950 and 1959 - so I'm assuming his 1950 was in error. (CO2 went up 9 ppm between 1959 and 1969.) I think he probably meant since some earlier time. Preindustrialisation it was 285 ppm. He's done this "trick" before to hide the incline! If he was saying it went up by 90 ppm since 1950, that would be a 28% rise not a 0.009% rise! PS I fixed the typo, thanks Martin. Sou, if you say so... I didn't read DDs article, not even as an archive copy (you never know if it might be infectious), just your rendering of his argument. I want to congratulate Silly Sou for the substance of the article, but name calling is beneath any scientific discussion and is downright silly. However, in the spirit of this webpage, I have followed suit and given Sou a moniker. It's also very silly to label someone a "denier" because they disagree with commonly held scientific beliefs. This is counter to the scientific method. Resorting to childish behavior such as name calling is in accordance with politics and has no place in scientific discourse. Thanks, M Taylor. Your comment deserves preservation at the HotWhoppery. Maybe later. Or not. So what do you call somebody who denies the earth is round, evolutionary theory or in this case that CO2 absorbs long wavelength radiation? It's just physics (in this case >150 year old physics). "It's also very silly to label someone a "denier" because they disagree with commonly held scientific beliefs"
For a start science is not about what beliefs. It's about theories based on an understanding of the physical world. For instance, if one was to deny germ theory and instead believe that disease is caused by 'bad air', then you are a denier of germ theory. If you deny that humans are enhancing the greenhouse effect, a fact that is not only observable, but measurable, then yes, you are a denier. I'm mean really. Is it just me or are deniers getting dumber by the minute. Hot whopper? Wheres the beef? You are guilty of libel..... plain and simple. While I am not done going through all of your's and Dr Easterbrooks claims, I do have something that jumped out at me. No where do I see that Dr Eastbrook state, that when it warms up that there is not a increase in water vapor. I believe what he is trying to state is, that there is not necessarily a increase of water vapor when there is a increase in CO2. And that in the modeling they may may be making that a forgone conclusion, which would be an error. Also, in measured observations, as water evaporates, it will reach a saturation point and return to earth in the form of precipitation, (i.e. snow, rain ect). Therefore, the amount of water vapor in the atmosphere maintains a constant "percentage range" of water vapor. (FYI: I am not picking sides, I am doing my own research to make up my own mind on this issue. I have my own concerns with both sides of this issue). I recommend you read up on the concepts of relative humidity and absolute humidity. An increase in atmospheric temperature increases the *absolute* amount of water vapor that it can hold before "precipitation" will occur, because the latter is mostly related to *relative* humidity. CO2 is a GHG and thus *will* increase atmospheric temperature. Note that a GCM does not have a built-in switch that says "x ppm extra in CO2 equals x% increase in water vapor". there is not necessarily a increase of water vapor when there is a increase in CO2. And that in the modeling they may may be making that a forgone conclusion, which would be an error. Model WV physics is not parameterised afaik. It's an emergent property. Anyway, no WV positive feedback and it gets hard (impossible) to explain palaeoclimate behaviour. I have my own concerns with both sides of this issue). What sides? There's the well-established and robust scientific argument and what, exactly?